Fresnel Joseph, born in Port au Prince, works since 2015 in Viva Rio’s project, Haiti Aqui. Fresnel Joseph arrived in Brazil in a different way from his fellows. 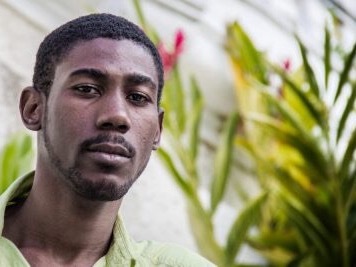 In 2012, he won a scholarship from an ONG to start a research about the Haitian’s life in Manaus. He survived to the earthquake without any consequences, except the loss of an uncle who worked as security in Port au Prince. What made him leave Haiti was his disagree with the policy line adopted in his country. Nenel, as his friends call him, took five hours to come back home after the earthquake. Rumours said that everyone from the place he used to live where dead. However, he found his mother and his three sisters safes and sounds and his house undamaged, lucky him! He graduated from his second year at the Administration University and thought it was the right time to stop studying and move on. His life in Port au Prince, where he was born, was a quiet life. His mother was the owner of two fabrics, one supermarket and one shop of construction equipment’s. His father was geologist. His desire of travel was stronger than anything. In Manaus he applied for a permanent visa and shortly afterwards, he left for Rio de Janeiro where he met some friends who already settle down. He found a place at Jacarepaguá. He still tried a technical course in construction. He organized events during two months. Under the influence of some friends he moved to São Paulo where he worked for a logistics industry operation. “The wage was way too weak to pay the bills”, he explains with his usual timidity. He packed again and came back to Rio de Janeiro in 2015, where he started working as radio producer in the project Haiti Aqui in Viva Rio. He has a decent way of life and lives in Leme, close to the south zone. Perfect place for the people who enjoy the beach with some Haitian and Brazilians friends. Meanwhile, he’s going on thanks a new job. He is a supporter of one of the national football club: Fluminense. He enjoys playing football but he had to take a break after he broke his two feet, the left in 2003 and the right in 2007. He used this time to get tan at the beach and organize barbecue with his friends. “In São Paulo, I used to eat the feijoada the Saturday. I’m still looking for to do the same in Rio.” he said. And only God knows about the future..!